Admittedly, coconut scares me. While some might stay away due to worries about fat, etc., I stayed away because I had an aversive experience with a coconut-laden curry when I was a tween. But I'm starting to get over my aversion. Macaroons are a common baking result of mine, and I have been recently known to drink coconut water before marathons. And then I started seeing recipes online calling for coconut oil, particularly baked goods. I had no idea that coconut oil is solid until I saw this jar for the first time. Then I realized that this is meant to be a substitute for butter. Here's my first cooking trial with coconut oil -- MANY more uses for this stuff can be found HERE. However, I opted to use a vegan carrot cake cookie recipe I saw on Oh She Glows for this little experiment, since I had the ingredients on hand, and I LOVE carrot cake! 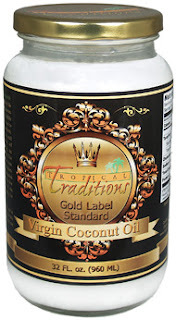 The coconut oil I used came from the folks at Tropical Traditions. The moment of truth: I had to scoop out 1/4 cup of coconut oil. Interesting texture, right? I put this in a bowl and microwaved it for about 25 seconds to melt it a little. It becomes more translucent as it warms. It smelled only faintly of coconut, possibly because it was still in this semi-solid form. I confess that in my absent-mindedness, rush, and stress, I didn't follow the instructions quite as well as I should have. I had to add some splashes of regular soy milk to get the mixture to even hold together. (I don't know WHY my camera decided to focus on everything BUT the subject cookie.) :( It was having a bad day, apparently, because I tried to take this picture several, several times. So kindly avert your eyes to the cookies in the background. Maybe this shot is better? No... agh! So since I flubbed a bit with the instructions, the cookies came out less sweet and not quite textured the way I had imagined. I was disappointed, but once again, "The Ukrainian" thought they were good, and he was actually glad they weren't too sweet because they had a good flavor and nice texture (besides the cookies being very fragile). I actually thought they were pretty good... definitely reminiscent of carrot cake but much, much more "pure." I can imagine there are lots of other ways to use coconut oil, but in my vegan baking adventures, I can definitely agree with it being a good substitute for butter/other oils. It also imparts a nice, light coconut flavor into foods. Check out this video for more information on virgin coconut oil! FTC Disclaimer: Tropical Traditions provided me with a free sample of this product to review, and I was under no obligation to review it if I so chose. Nor was I under any obligation to write a positive review in return for the free product. I'm not sure I knew it was a solid either. I learn something new everyday! I love coconut, but I've never tried coconut oil. I didn't realize that it was a butter substitute. Those cookies look good.